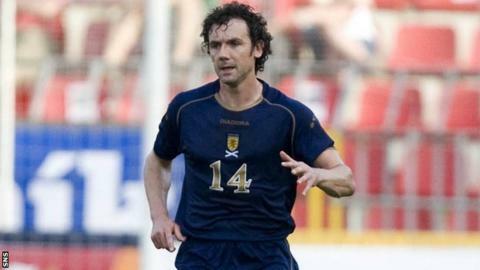 Former Scotland defender Christian Dailly believes footballers need to find ways to improve fitness and technique throughout their career. Dailly, who retired earlier this year at the age of 38, is now involved in coaching athletics. "There are definitely things that can be improved," he told BBC Scotland. "If you were to put somebody through a whole plethora of tests when they're about 20 and did it again when they're 30, they're probably no different." Sixty-seven times capped Dailly represented nine clubs, starting with his breakthrough at Dundee United and including subsequent spells at Derby County, Blackburn Rovers, West Ham and Rangers. And he insists his retirement came "purely by choice". "I probably could play for another five years," he said. "I want to start moving on and start looking at something else, other things like performance. "I have, my whole life, been interested in performance and come from a more athletic-type background. "I've experimented with different types of training. You try and find what works for you. "In football, you play every week. It's a difficult sport to train for at times because of the number of competitions that there are week in, week out. "Certainly individual things that can be improved. I don't think, just because you become a professional footballer at the age of 16 or 18, that's you made it and you can't improve any more. "Things should be in place that can help people improve in all sorts of ways right throughout their entire career. "The only thing you might improve is your endurance, or it might be your acceleration that improves, or it might be your strength. Your vertical leap might improve. Whatever it is then you want to improve. "I think people have got to look a little bit longer-term. "If a lot of footballers were helped with that, shown different ways of training or exactly how to look long term at some of these basic abilities they've got just to try and improve them throughout their career, you'd probably find that more players would play longer. "They'd probably enjoy the games more because they'd feel better more often. "It's just a part of it, but it could be the making of some people."